Sinhala colonists who have encroached into traditional Tamil areas in Batticaloa have again started to shoot and kill the cattle belonging to Tamil dairy farmers in Paduvaankarai region. Dairy farmers in Ko'ra'lai-pattu South blame three Sinhala encroachers as culprits after one of their cows was shot and killed on Thursday night. The farmers said they have recovered three of their cattle with gunshot injuries. Between 2013 and 2016, more than 1,000 cows, owned by Tamil dairy farmers were shot and killed. The process was accelerated after Sirisena coming to power. However, due to relentless protests and complaints, the menace was temporarily halted from the end of 2016. Now, it resumes again, Tamil farmers said. 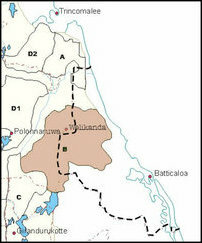 Paduvaan-karai was protected by the Liberation Tigers of Tamil Eelam (LTTE) before the end of war in the East in 2007. The latest incident comes amidst reports that the occupying regime of Maithiripala Sirisena is set to launch a major Sinhala colonisation programme targeting pasturelands in the country of Eezham Tamils. Armed Sinhala colonists launched a large-scale encroachment into Paduvaan-karai after the end of the genocidal war on Eezham Tamils in 2007. 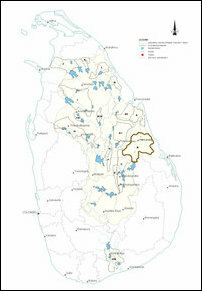 The first phase of Sinhala colonization targeted the pasturelands at Mayilaththa-madu and Maathava'nai in Koa'ra'laip-pattu South division. Thousands of acres lands, traditionally used by Eezham Tamil dairy farmers as pasturelands for their cattle, were taken over by SL military-backed Sinhala ‘home guards’, who were converting the grazing lands into their farming lands. Tamil farmers were assaulted by the home-guards and Forest Department guards. Following repeated complaints, legal suits and finally Tamil dairy farmers going to the extent of waging a continued protest of boycotting milk supplies to SL government-owned Milco company in 2016, the encroachments came to an end in Mayilaththa-madu towards the end of 2016. A number of huts put up by the intruding Sinhala were dismantled. Around 300 Sinhala colonists were instructed to vacate from the pasturelands. However, the colonists were constantly wandering around the abandoned structures for some months. Three of the colonists continued to stay and engaged in agriculture in large tracts of lands with the backing of Sinhala military and police. In the meantime, SL Mahaweli Ministry, which is led by SL President Maithiripala Sirisena, has schemed a major Sinhala colonisation programme targeting the pasturelands of Eezham Tamils in two administrative divisions of Paduvaankarai region in Batticaloa district. Hailing from Polonnaruwa, Mr Sirisena has been implementing a long-term Sinhalicisiation agenda within the so-called System B, which is the largest of Mahaweli ‘Development’ programme, consisting of 75,441 ha., including 27,179 ha of irrigable lands in Polonnaruwa and Batticaloa districts under the pretext of ‘development’. While 320 Tamil dairy farmers from the two divisions of Ea'raavoor-pattu (Chengkaladi) and Koa'ra'laippattu South (Kiraan) are already struggling without adequate pasturelands for their cattle, the SL Mahaweli ministry, which comes under Mr Maithiripala, has sketched out a new plan to distribute 49 acres per Sinhala colonists through a leasing programme. The overwhelming majority of the recipients are going to be Sinhala farmers from Polonnaruwa, the home electorate of Mr Maithiripala. The programme, if allowed to be implemented, would be one of the disastrous Sinhala colonisation schemes to affect the demography of Batticaloa district. The World Bank is alleged of assisting Mr Sirisena without paying attention to the discriminative ‘development’ agenda of SL unitary State's structural genocide against Eezham Tamils.